If you follow me on Instagram (shameless plug) then you might have noticed that I’ve been talking a lot about cruelty-free, eco-friendly products on my stories lately. On my own time, I’ve been going through a lot of products I own, checking if they’re cruelty-free or not, and trying to find alternatives to the products that aren’t. It’s a loooong process (I have a lot of products), but it’s one that I really want to pay more attention to, because it’s important to me - and I know a lot of you guys care about cruelty-free products (and the environment), too. Which is why I’m really happy to be able to review these 2 products from Naturally Serious’ new line. The brand sent me their Hydra-Plumping Mask and 3-in-1 Lip Serum, and before then, I have to admit I had never even heard of them. When I received my package, it said “Peter Thomas Roth” on the shipping label, and naturally, I thought it was the product I was expecting from PTR (I’m a HUGE fan of their brand, but once again, you guys know that if you’re regulars on here). Needless to say I was surprised to find these 2 products inside. 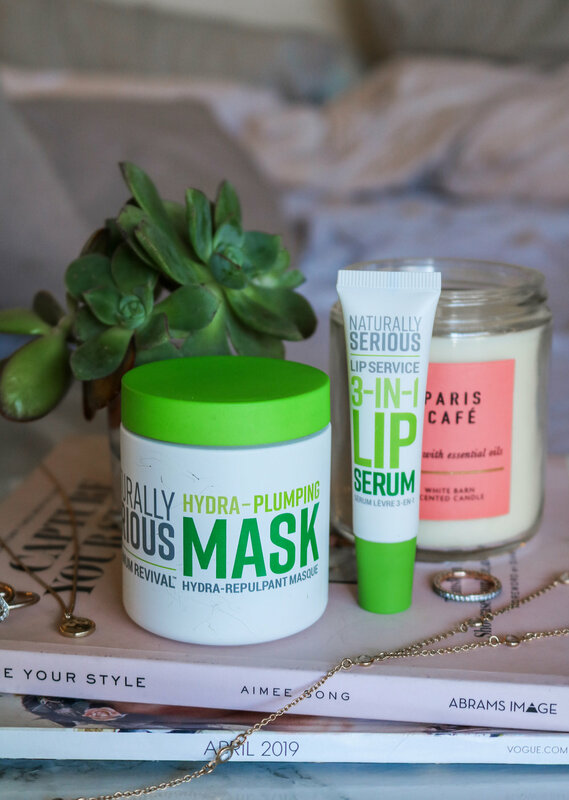 So I did a bit of research, and it turns out that Naturally Serious is a brand founded by June Jacobs, who was Peter Thomas Roth’s partner for a very long time before launching her own brand, June Jacobs, and now Naturally Serious. Immediately, I was intrigued. I literally went like that Leo DiCaprio meme that says “you had my curiosity, but now you have my attention”, ha! The same day, I tried both products on, and I have to say, they’re as good as I thought they would be. Now once again, I want to be 100% transparent, so I feel like a little disclaimer is in order: I received these products for free, so I didn’t pay for them… But the decision of reviewing them on my blog is entirely my decision, and I wasn’t asked to by the brand. I also wasn’t paid for it, so I’m only doing this review because I love sharing the products I discover and love with you guys… In fact, that’s what this entire blog is about - that and style and beauty tips, of course. On a side note, I feel like I need to say that I’ve received many, many products that have never made it on the blog. I’ve either messaged the brands and said that I wouldn’t be reviewing their product because I had a negative experience, or included them in a “first thoughts” group review and explained why they didn’t work out for me. So trust me when I say that every single review you see on The Hungarian Brunette is 100% honest, real, and represents my thoughts and my thoughts only. That being said, I didn’t have to do any of that this time, because these products are the BOMB. Both of them are obviously cruelty-free and eco-friendly, but they’re also super clean, since they’re formulated without (brace yourself) parabens, phthalates, preservatives, formaldehyde, petrolatum, PEG, mineral oil, sulfates, silicones, drying alcohols and artificial colours or fragrances. On top of this, they also manufacture their packaging in a wind-powered, carbon neutral facility. Since the product is also made in the USA, that also cuts back on transportation, which can also be quite polluting. Basically, this is as clean, natural and respectful as it gets. This is the product I tried first, and I was really intrigued by it, because it says it contains an “anti-pollution blend”. Since air pollution is a big issue in LA, I feel like this is so on brand, it’s not even funny. Seriously though, I’ve heard a lot of people say that their skin and hair got a lot worse when they first moved to LA, and it’s definitely something I’ve been experiencing myself, A LOT. When we first got here, my acne was so bad I was embarrassed to get out of the house. Obviously I got it under control now, but it definitely feels reassuring to know that this has got my back when it comes to pollution. Because another sad effect of pollution on my face is how dry my lips are. I’ve always been a super intense user of lip balm (I like ‘em soft) but since we’ve been in LA, it’s just next level… My lips are DRY, no matter what season it is. I’ve tried a lot of really cool lip products in the past (like this lip mask and this lip mask and lip balm duo, to name a few) and I’ve even made my own lip balm - see the full tutorial here. But I feel like every time I try on a new lip product, it works for a while, and then my lips get used to it and I have to move on to something else. I’ve used this lip serum every day for about a week now, and I’m incredibly pleased. I need to say though, it’s not a pretty lip balm. So if you’re looking for something pink and cute that’s gonna make your lips look cute, this ain’t it. It’s white, and it looks like you lips are covered in moisturizer… But that’s probably why my lips have never been that soft. I like to apply it on my lips in the morning, right after brushing my teeth, while I do my makeup. I’ll leave it on the whole time, and then I’ll wipe if off, dry brush my lips, reapply a suuuper thin coat of it under my lip gloss and go on with my day. At night, right after the shower, before going to bed, I’ll put it on again, and wake up in the morning with super soft lips. Keep in mind that this isn’t one of those lip masks made by a makeup company, it’s a lip serum made by a skincare brand, so it feels more “clinical” than pretty, but then again, that might be why it works so well. On top of making my lips feel and look super soft, it also got rid of the “lines” on my lips, that usually form when my lips are super dry and cracked like an old dried raisin. After a few days of using this twice a day, my lips now look more plump, probably from the hydration. I don’t want to say this looks like I’ve got lip injections, because it doesn’t. But just like when you do a super hydrating mask and your skin looks all tight and plump, this is what it did to my lips. It’s made with apple extract, hyaluronic acid, squalane, sunflower seed oil, colloidal oatmeal and jojoba seed oil, amongst other ingredients, and it has a delicate smell that I can’t quite pinpoint, but it does smell very “natural”, but in the best possible way. Just in case it wasn’t clear enough from this review, I highly recommend this lip serum, especially if you have chronically dry lips like I do and you haven’t found something that’s fully efficient on your lips. I tried this mask right after coming back from Palm Springs, where it was super dry and SO windy. On a side note, I don’t know if this is a very happy coincidence, or if someone from the brand really did their research, but I feel like it’s so appropriate that they sent me both the lip product and the face mask, because these have to be the 2 products I talk about the most. At first, I thought this was gonna be like a clay mask that dries up, because it’s made with kaolin clay, but it couldn’t be farther from the truth. It actually doesn’t harden when it dries, it becomes kind of like a rubber texture, which is super comfortable and doesn’t pull on the skin. It’s also much easier to clean up, which I really appreciated, because cleaning up a face mask is by far my least favourite part of the process. Aside from the kaolin clay, it’s made with colloidal oatmeal, hyaluronic acid, shea butter, ceramide NP, fatty acids and then some… The whole blend being designed to moisturize, soothe and dissolve the excess oils and impurities. After wiping it off, I truly felt like my skin was more hydrated, plump and soothed. I also noticed how my pores seemed a little less visible (my main skin issue) and my face overall seemed more glowy and youthful. I was sporting the kind of healthy matte glow that I love. Not dry, not oily, just the perfect amount of glow. The Goldilocks of glows, if you will. This is definitely the kind of mask I would use after a weekend in the desert (perfect for festival season coming up) or when traveling, when your skin is super dry from the plane. While we’re on the subject of traveling, a cool detail about this mask is that it’s TSA approved, meaning it’s exactly 100ml, so you can travel with it without any problems, even if you’re only bringing a carry-on. If you like to travel light like I do, this is a real life-saver, because I’m always pulling my hair out when I’m going away for a weekend and want to bring a mask. The last thing you want is for your expensive skincare to be taken away at the TSA checkpoint, am I right?! Just like the lip serum, the mask has a really great smell that I can’t quite pinpoint, but it smells super natural and clean, if that even makes any sense. The smell also didn’t go away during the drying process, which made it a very pleasant and relaxing experience, and you guys know I love myself a good spa-like experience when it comes to skincare. And for those of you who are wondering: No, the fragrance isn’t overwhelming, and yes, it is natural. I don’t know if this is psychological or not, but I also felt like my skin felt better from using such a clean, natural product. Does anyone else relate to that, or am I crazy? Obviously I only tested these 2 products from he collection so far, but there are 7 products total currently available at Sephora, including an eye cream, peel pads, cleanser, to name only a few. I linked them all right below so you guys can check them all, as usual, and I feel like I’m personally most excited about the moisture serum and the anti-pollution repair cream, which seems like a really cool product. What’s your take on eco-friendly, natural and cruelty-free products? Is it something you pay attention to? Let me know in the comment section below, I love hearing what you guys think!